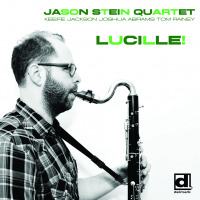 Jason Stein continues to curve a niche in the jazz world, but it's not what you might assume. Listeners straightaway assume that he is an idiosyncratic outlier because his sole instrument is the bass clarinet. We've grown accustomed to saxophonists like Eric Dolphy and David Murray doubling on the bass clarinet. Stein's constancy to this one woodwind instrument, like Germany's Rudi Mahal, is unequivocal, yet the sound of the instrument doesn't define his trajectory. The Tristano connection is heard on two covers, "April" and "Wom," plus music by his disciple Warne Marsh, "Marshmallow." The Stein/Jackson combination recalls the Marsh/Lee Konitz adaptations. Stein's original composition "Halls And Rooms" uses that partnership as a jumping off point, before taking us down a twisting road, saxophone and bass clarinet incited by Rainey's chattering clatter. The combination of horns quickly sheds any inclinations of pretentiousness. Even Charlie Parker's "Dexterity," rendered with Jackson on contrabass clarinet, doesn't get swamped by the heaviness of the woodwinds. The pair perform a sort of sleight of hand, performing at an escape velocity not imagined by their instrument makers. What is unique here is just that, the quartet's expression is not limited by the choice of instrumentation, it is actually liberated by it. Monk's "Little Rootie Tootie" is given a whitewater rapids treatment with both clarinets barking and biting multi-phonic shouts. Same for "Roused About," Robert Hurst's dedication to Monk's longtime saxophonist Charlie Rouse. Jackson (back on tenor) and Stein play a joyous cat-and-mouse game with the theme as Abrams and Rainey dance the night away. This is one dynamic session. Track Listing: Marshmallow; Halls And Rooms; Dexterity; Roused About; Ryder’s Uncle Dragon; Wow; Little Rootie Tootie; I Knew You Were; April. Personnel: Jason Stein: bass clarinet; Keefe Jackson: tenor saxophone, contrabass clarinet; Joshua Abrams: bass; Tom Rainey: drums.